Video Art. An Anthology. Compiled and Edited by Ira Schneider and Beryl Korot. Managing editor Mary Lucier. New York and London, Harcourt Brace Jovanovich, 1976. Formato quadrato, cm. 23,7; brossura; pagine 286, (2) con più di 500 illustrazioni in nero, tra fotografie e disegni. Interessante antologia, comprende scritti, dichiarazioni e documentazione visiva sul lavoro di 73 artisti. 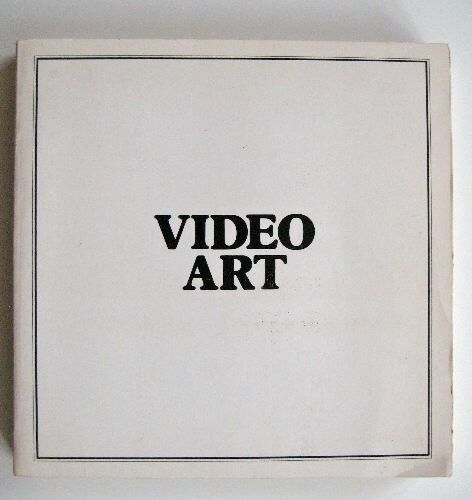 Vito Acconci (10-Point plan for video, molto interessante); Ant Farm; Eleanor Antin; John Arvanites; Mary Ashley; John Baldessari (The Italian tape, girato con Carlo Buti. Italian hand gestures with English and Italian translations make up a hypothetical dialogue between an america artist and an Italian critici, which finally ends in an impasse. p. 18); Stephen Beck (Videographics); Lynda Benglis; James Byrne; Eric Cameron; Peter Campus; Davis Cort (Videophones and videomirrors); Douglas Davies;DimitriDevyatkin; Tom Dewitt; Juan Downey; Ed Emschwiller; John Fleming; Charles Frazier; Hermine Freed; Dieter Froese; Davidson Gigliotti; Frank Gillette; Joel Glassman; Dan Graham (Interior space/exterior space. An addition to a Conventional House); Ernst Gusella; Julia Heyward; Ralph Hocking; Nancy Holt; Rebecca Horn (Pencilmasks e Cockfeathersmask, molto intriganti); Joan Jonas (...Video is a device extending the boundaries of my interior dialogue to include the audience. The perception is of a double reality: me as image and as performer. I think of the work in terms of imagist poetry; disparate elements juxtaposed... alchemy. p. 73); Daile Kaplan; Beryl Korot; Paul Kos; Jack Krueger and Paula Barr; Shigeko Kubota; Les Levine; Alvin Lucier; Mary Lucier; Andy Mann; Susan Milano; Antonio Muntadas; Dennis Oppenheim (Mind twist); Nam June Paik (Input-time and output-time); Charlemagne Palestine; Tony Ramos; Steve Reich; Bill Ritchie; Lynda Rodolitz; Ira Schneider; Ilene Segalove; Richard Serra (Boomerang e Television Delivers People, 1973, interassantissimo lavoro sulla televisione commerciale); Willoughby Sharp; Michael Snow; Nina Sobel; Keith Sonnier; John Sturgeon; Skip Sweeney and Joanne Kelly; Anne Tardos; Ben Tatti; Paul Tschinkel; Woody Vasulka (Electronic image sequences), Bill Viola (Amazing colossal man video piece. In August I got hold of a video projector for use in my studio, which was above my home in a residential neighborhood in Syracuse, N.Y.I made a videotape of my face, very close up, pressing against a pane of glass, and banging andyelling loudly. Late one night, unannounced, I videoprojected that tape on a rear screen stretched behind my two windows facing the street. The sound was amplified top volume on two loudspeakers behind the windows facing the street. The sound was amplified top volume on two loudspeakers behind the window. This all lasted for a few hours and was widely acclaimed by the unsuspecting local residents as the most exciting event on the block in years. p. 137); Bill Wegman; Bob Wiegand; Ingrid Wiegand; Walter Wright; Jud Yalkut. Seguono scritti e interventi critici molto interessanti, tra i quali citiamo quello di Bill Viola, The European Scenes and other Observations.